The Humanities CLEP will test your knowledge of art, music, dance, theatre, poetry, prose, film, and philosophy. You may be asked to identify the region and time period of certain types of art and architecture. You may be asked to identify the creators of certain philosophies and who they influenced. Finally, you may be tested on your knowledge of artistic concepts and techniques. These may be the different types of architecture and paintings, the meter in poetry, or the birthplace of a certain type of dance. The Humanities CLEP was one of the first CLEP's I ever took. I purchased a very expensive study guide from the Internet, studied for about a week, and then went to the testing center. I had already known a great deal of the material on the study guide, so I felt pretty confident about my chances. However, before I finished the first 10 questions of the exam I knew I was in trouble. By the end of the exam, I was using "best guess" methods. Famous ballerina? Hmm, her name looks Russian. Famous opera tenor? He sounds Italian! I wish I was kidding, but I'm not. I was desperate. CollegeBoard comes right out on their site and says, "Because the exam is very broad in its coverage, it is unlikely that any one person will be well informed about all the fields that it covers." I don't want you feeling as dumb as I did when I walked out of the testing center. Your job is not to know everything on this exam. Your job is to know enough to pass. I highly suggest taking the English Literature CLEP and American Literature CLEP exams before you attempt this one. First of all, much of the material covered in those will show up in the Humanities exam. Secondly, it's another 12 credits so you're basically being awarded credits while preparing for the Humanities CLEP. Not a bad deal! I preach the virtues of Instant Cert quite a bit, but this is exactly the type of exam that it excels at. This exam is so broad that targeted study is the only sane way of approaching it. Looking at this list, it should be apparent why I suggest taking the English Literature CLEP and American Literature CLEP exams before this one. Learn the material for those exams and you'll be well prepared for 50% of the material on the Humanities CLEP. Poetry - Don't forget to study the different types of meter. (scroll down). Also do not neglect the poems in this link! Music - Know the periods the composers lived in as well as the more famous works. Read the Wikipedia articles at least once! Beethoven - German composer between Classical/Romantic eras. Went deaf. Mozart - Child prodigy of the Classical era. Influenced Beethoven. George Handel - Wrote "Messiah" which includes the famous "Hallelujah Chorus"
Paintings/Sculptures - See more famous painters here. Edvard Munch - Norwegian Symbolist painter. Painted "The Scream"
Vincent Van Gogh - Pioneer of Expressionism. 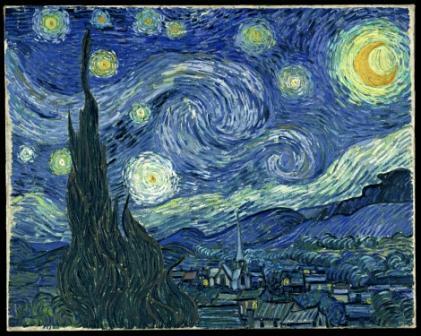 Painted "The Starry Night", "Road with Cypress and Star" and many portraits of the poor in Paris. Claude Monet - Founder of the Impressionist movement in France. Painted "Water Lilies", "London, the Parliament" and many others. Mozart - Co-wrote a series of operas that are still performed today. Most famously "The Marriage of Figaro" "Don Giovanni" and "The Magic Flute"
Richard Wagner - German composer of the late 19th century. One of the only composers to also write the scenario and libretto of his works. Wrote "Tristan and Iseult" based on the Arthurian love story. Giuseppe Verdi - Italian opera composer, popularized the Italian opera. Composed "Rigoletto", "Il trovatore", "Don Carlos", "Otello", and "Falstaff"
Claudio Monteverdi - Wrote "L'Orfeo" which is considered one of the first opera that is still performed today. Dance/Ballet - Ballet originally developed in France, adopted by England, Italy, and Russia. Ballet Blanc - Focused on one ballerina with the rest of the corps of ballet all wearing white. Expressionist Dance - Related to the German expressionist movement, takes a more relaxed attitude towards dance than ballet. Famous dancers of this school include Mary Wigman, Alwin Nikolais, and Rudolf Laban. Neoclassical ballet - 20th century ballet concentrating on the dance rather than the theatre. George Balnchine, Kennth MacMillan, and Frederick Ashton are all choreographers of this school of dance. Modern Dance - 20th century dance that concentrates on self-expression rather than rote technique. Often characterized by floor work, obstacles, and heavy use of gravity. Greek Columns - Know these by sight (Hint: Pay attention to the tops). As hard as it may be to believe, this is not a comprehensive list. The Humanities CLEP covers a staggering amount of information, and I've tried to include only the highlights above. I highly recommend seeing the Instacert Specific Exam forum for this particular CLEP. There is an excel spreadsheet also in the thread that does a nice job of summarizing the poets and authors. You'll find out about InstaCert below if you aren't already a member. CLEP Humanities w/CD-ROM (REA) The Best Test Prep for the CLEP (Test Preps) - I thought the exams provided were actually more difficult than the Humanities CLEP. If you're doing well on these, then you should be good for the exam. Cracking the CLEP, 5th Edition (College Test Preparation) - Originally posted this for the Social Sciences and History CLEP, but it applies to the Humanities CLEP as well. You get quite the bang for your buck with this book. This covers multiple tests, of which the Humanities CLEP is one. It also covers Social Sciences and History and Natural Sciences (another two broad but shallow exams), English Composition, and College Mathematics. Definitely worth the money if you plan on taking these exams. InstantCert Academy - Humanities Specific Exam Feedback - Five pages of study notes, specific topics of study, and after action reports from returning test-takers. This thread is spot on for the test. If you are already a subscriber, take advantage of this! Also, definitely check out the Flashcards! Many of them cover the same material you will see on the exam. Jeez, if you're sick of reading about the Humanities CLEP by now, how sick do you think I am of typing about it? This test is extremely broad. I always recommend taking the general studies CLEP exam after you've already knocked out the rest of the CLEPs in that category. The same holds true here. At least finish the American and English Composition CLEPs first. The preparation for those two will help you with the Humanities CLEP. If you don't need to take those two, then just start studying now. Don't panic if you have no clue on many of the questions. Make educated guesses based on what you've studied. Remember: Even CollegeBoard admits that it's very rare for one person to know everything on this exam. It's worth six credits, and you can do it if you dedicate some effort. Go get em!